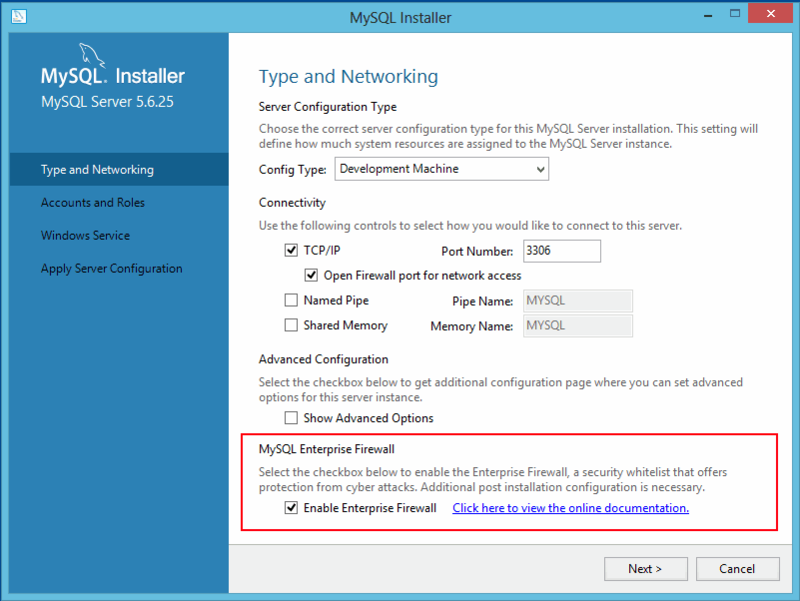 On Windows, MySQL Installer includes an option to enable MySQL Enterprise Firewall for you. MySQL Workbench 6.3.4 or higher can install MySQL Enterprise Firewall, enable or disable an installed firewall, or uninstall the firewall. Manual MySQL Enterprise Firewall installation involves running a script located in the share directory of your MySQL installation. If installed, MySQL Enterprise Firewall involves some minimal overhead even when disabled. To avoid this overhead, do not install the firewall unless you plan to use it. MySQL Enterprise Firewall does not work together with the query cache. If the query cache is enabled, disable it before installing the firewall (see Query Cache Configuration). For usage instructions, see Section 6.6.3, “Using MySQL Enterprise Firewall”. For reference information, see Section 6.6.4, “MySQL Enterprise Firewall Reference”. If MySQL Enterprise Firewall is already installed from an older version of MySQL, uninstall it using the instructions given later in this section and then restart your server before installing the current version. In this case, it is also necessary to register your configuration again. To install MySQL Enterprise Firewall using MySQL Workbench 6.3.4 or higher, see MySQL Enterprise Firewall Interface. win_install_firewall.sql: Choose this script for Windows systems that use .dll as the file name suffix. linux_install_firewall.sql: Choose this script for Linux and similar systems that use .so as the file name suffix. The installation script creates stored procedures in the default database, so choose a database to use. Then run the script as follows, naming the chosen database on the command line. The example here uses the mysql database and the Linux installation script. Make the appropriate substitutions for your system. MySQL Enterprise Firewall can be uninstalled using MySQL Workbench or manually. To uninstall MySQL Enterprise Firewall using MySQL Workbench 6.3.4 or higher, see MySQL Enterprise Firewall Interface. To uninstall MySQL Enterprise Firewall manually, execute the following statements. It is assumed that the stored procedures were created in the mysql database. Adjust the DROP PROCEDURE statements appropriately if the procedures were created in a different database.